Vanessa Cowan at the Western College of Veterinary Medicine. Photo by David Stobbe. USask research has shown that beef cows that ate ergot-contaminated feed showed signs of poisoning even at concentrations deemed safe by Canadian livestock guidelines, and after a short-term exposure to the toxin. Ergot, a harmful fungal toxin in grain, is an increasing problem for the health of Canadian cows and quality of crops. Ergot exposure negatively affects cows’ milk production and causes symptoms of gangrene, which means the flesh rots due to the decreased blood flow in the body. This leads to ear tips and tails falling off. Cowan has found that beef cows that ate ergot-contaminated feed showed signs of poisoning even at concentrations deemed safe by Canadian livestock guidelines, and after a short-term exposure to the toxin. Her results also show that the blood flow in the cows’ tails diminished even at ‘safe’ quantities due to progressive shrinking of arterial blood vessels from ergot poisoning. 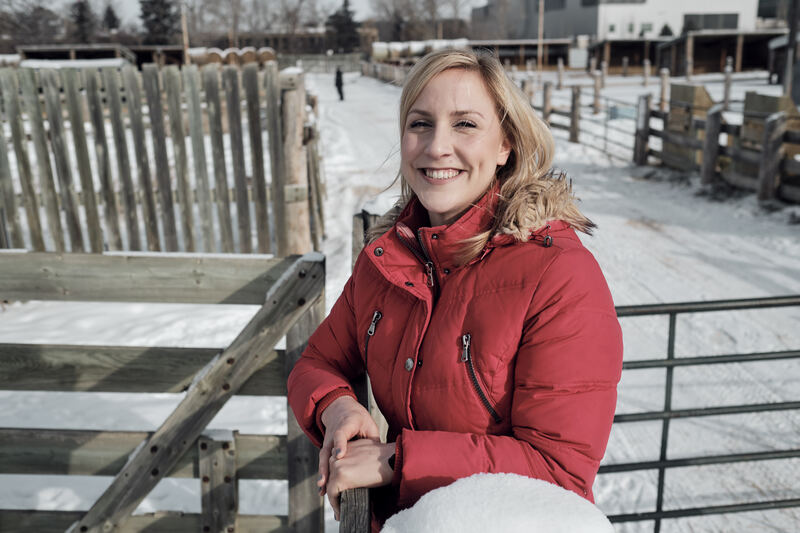 Her study, funded by the federal agency NSERC and the Saskatchewan government’s Agriculture Development Fund, is published in Frontiers of Veterinary Science. People can get poisoned from eating contaminated grains, but not from animal-derived products such as milk or meat. In humans, gangrene may appear with psychosis and LSD-like hallucinations. Vanessa Cowan (left) and Barry Blakley at the WCVM. Photo by David Stobbe. In Canada, Blakley said, ergot contamination of crops has increased in the last few years due to wetter summers and a lack of consistent crop rotation. “New farming techniques involve less crop rotating and plowing, which in the past has helped bury ergot in the soil and minimized the spread of the fungus to crops and other farmers’ fields,” he said. He noted farmers cannot sell contaminated crops, and exports abroad may also suffer. Cattle and crop producers are aware of ergot and regularly inspect crops for contamination, which is indicated by dark, kernel-like structures in the grains. Producers often realize their cattle have been exposed only when the animals show symptoms. Prairie Diagnostic Services, co-owned by the WCVM and the Saskatchewan government, is one of two labs in Canada able to run the test, which costs around $90. The lab runs 75,000 analyses per year for a variety of contaminants, 50 per cent of which are made up of mycotoxins like ergot. “USask is the best place to study ergot because of the excellent toxicology program, the WCVM, and the new university’s livestock facility for doing research on large animals,” said Cowan. Cowan, Blakley and Singh have also completed a study on long-term ergot exposure in beef, which will be published in the summer. Vanessa Cowan at the WCVM. Federica Giannelli is a graduate student intern in the USask research profile and impact unit. This article first ran as part of the 2019 Young Innovators series, an initiative of the USask Research Profile and Impact office in partnership with the Saskatoon StarPhoenix.